VertaseFLI was appointed to carry out remediation and groundworks in Asbestos Containing Material (ACM) during the construction of a University Technical College (UTC) on a former Rail Depot in Swindon. 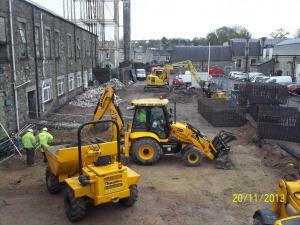 The client identified ACM on site just prior to the commencement of demolition works. VertaseFLI was engaged to advise the client on the most appropriate and robust way forward to ensure that there was no risk for the site workers or the future UTC users. Regulatory negotiation and agreement on plan of works, management and disposal of Asbestos Containing Materials, asbestos Air Monitoring, advice and guidance on later groundworks, remediation scheme design including regulatory approvals. VertaseFLI firstly produced a remediation plan of works and engaged with the Local Authority to obtain their agreement for the plan. We also established asbestos air monitoring to ensure that the existing workforce was protected. Construction of, and alteration to existing Storm and Foul Water Drainage in Asbestos containing made ground. 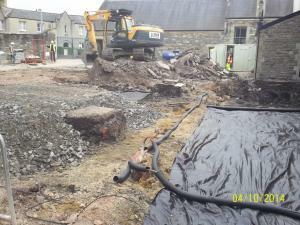 Reduced level excavation and disposal of asbestos containing soils to enable the installation of new foundations. Import and placement of certified clean material. Removal of concrete slab within former building above suspected asbestos containing soils to enable installed of reduced floor and lift pit. The works also required close interaction with the construction team and co-ordination with the various other subcontractors engaged on the Principal Contractor’s behalf.